Parallel turns are the essence of modern alpine skiing. The goal eventually is a perfectly carved smooth turn with no skidding. However very few people put a pair of skis on, for the first time, and make parallel turns. In your first lessons, you should have learned good athletic stance on skis, stopping and turning with your wedge. Many instructors are moving away from the Stem Christie, a wedge turn where the skis match crossing the fall line, feeling that skiers can pick up parallel turns without the middle step. However, it can build confidence and enforce faith in a skiers balance. Start by matching your skis as you cross the hill in your turn. Beware of other skiers and know that crossing the whole hill is not safe. Return to the wedge as you move your skis into the fall line, and match them again as you again point your skis across the hill. Releasing your edges is important to a successful parallel turn. To perform the open parallel, flatten your uphill ski and rotate it into the fall line with the downhill ski. Maintain the parallel relationship as you come out of the fall line. Your weight should be as close to 60/40 on the downhill/uphill skis as you can. Turn your skis until they point up the hill to complete the turn. You will naturally tilt the skis, utilizing similar edges, rather than the opposing edges of a wedge. To start the next turn lead with your downhill knee, flattening the ski. Transfer your weight to the uphill ski which is about to become the downhill ski, simultaneously rotating your legs to keep the skis parallel throughout the turn. As your skis point across the hill, weight and un-weight each ski stepping your feet in a walking motion. Walk through the whole turn, pointing your skis into the fall line and then back toward the uphill. This will help you gain balance on each foot, so you can release the pressure and edges. Dynamic parallel turns add flexion/extension and increased edging to the open parallel. On groomed surfaces parallel turns use the motions in a balanced manner; moguls and steeps use the same movements to varying degrees. Balance on your whole foot with your knees and ankles bent as you make open parallel turns. Begin by flexing, bending down further—without bending over at the waist—then extend as you enter the fall line, flex again as you point your skis across the hill and up to finish the turn. Remember in complete turns point your skis 45º downhill, then into the fall line, then turn out and back to 45º uphill. Having patience in each part of the turn will allow more time for the edging, rotation and flexion/extension movements. Move your extension down hill. Pretend your hips are headlights, keep them pointed down the hill, thrusting them into the new turn while extending your legs. Lastly imagine your legs are a pendulum separate from your upper body keep your hips and shoulders square to the fall-line. Garlands: stop at the end of a turn with your skis at 45º uphill. Twist your thighs so your hips point down hill. Thrust your hips into the new turn extending your body down the hill. Notice how your edges release and your skis automatically rotate into the fall line. Stop and repeat the motion on the same side. Turn around and repeat on the other side. Box turns, aka patience turns: In your mind imagine each turn is a box. Start skiing across the hill, cut the corner and point your skis into the fall line, count to three or four, cut the corner again pointing your skis across the hill, cut the corner one last time as if you are going to complete the box by going up hill. In between each box, extend your hips downhill to start the new turn. Taking time at each point in the turn will round out your turn shape and eliminate skidded Z turns. 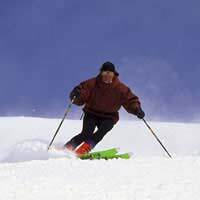 Parallel skiing is the principal turn in skiing. With it, you best use edging, rotation and flexion/extension movements to descend all types of terrain. It is what makes skiing look graceful, fluid and beautiful.